Chaurus Reaper is a common Agility creature card. It is part of the Core Set. In addition to the card's availability in the Core Set, two copies are included in the Black Marsh Smugglers deck, one copy in the Brynjolf's Heist theme deck, and one copy in the Dagoth's Might theme deck. 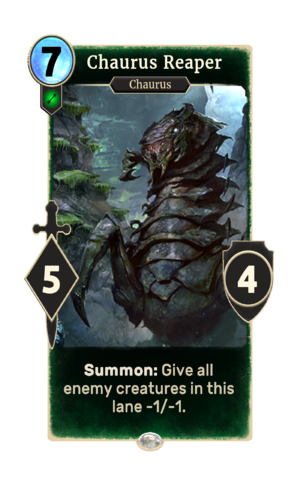 The card's summon ability applies the Chaurus Bite card effect. Chaurus first appeared in Skyrim.